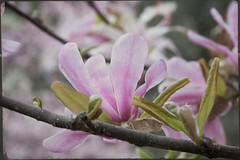 Today I am sharing more magnolia blooms. This is another shot from April 11 at the Morton Arboretum. I'm almost done posting them all. I just love the pretty pink flowers on these. Pretty soon the blooming trees will be gone so enjoy them while they are in bloom. Those are pretty. Its a shame that all the blossoms on the trees don't last longer. I like seeing this up close. I've seen a few trees like this, but I haven't had a chance to get very close. Thanks. :-) i wish they had blossoms longer too. Ratty - they are pretty up close but I like to get close to everything it seems. My macro lens is my favored.